This is the history box to 'Stelios Jackson Walks Crete' -Chapter Eight: Selakano to Aghios Georgios. Lassithi, with its 17 villages, is among the highest inhabited areas in the whole of Greece. In its total of 30 square kilometres, the variation in altitude across the whole plateau, is only 33 metres (817-850 metres), giving it its level playing field appearance; certainly from a distance, it looks totally flat, and somehow out of character for this undulating island An excellent, anthropological book to the area in general, and the village of Magoulas - just south of Psychro - in particular, is 'Village on the Plateau', by Sonia Greger; available from you know who. A centre of revolution against Draconian Venetian rule in the 13th century, the Venetians depopulated the area in 1263, and forbade cultivation due the rebellious nature of the locals; a couple of centuries later, when Venice's desperate need for corn necessitated, the plateau was allowed to be resettled .The ditches (or "linies), still in use today for drainage, are of uncertain date. It is almost certain that these date to Venetian times, and the recultivation of the area, but some people believe that they are, in fact, Roman. In the 16th century, people of the Peloponnese settled here, to escape the Ottomans, who had taken mainland Greece. Of course, by the end of the following century, Crete too was under Ottoman rule, and the plateau was destroyed, twice, under the Ottomans, in the 19th century. The plateau is dominated to its south, by the Dikteian range. We have a slight problem with nomenclature here. As I said in chapter four, part two, there is a growing feeling that the Dikteian cave, the birthplace of Zeus in Greek mythology and currently placed just above the village of Psychro, in Western Lassithi, is in fact at the eastern extreme of the island, at Petsofas, not far from Palekastro. Just when this range of mountains was given the name 'Dikti', is uncertain. 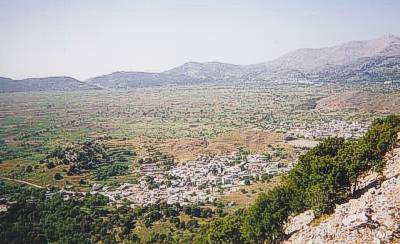 According to Greger, the locals of Magoulas, call the range by their "traditional name, Madara". The area is well worth a visit, despite the fact that its traditional tourist attraction - the white-sailed windmills, of which there were said to be close to 10,000 - have all but disappeared, other than to attract the tourists, if you see what I mean. Nowadays, tourists tend to come to escape the heat of the coastal areas; the Lassithi Orepedhi, as it is known in Greek, is markedly cooler than the coasts, and can be a breath of fresh air, in the height of summer. Important sites, other than the so-called Dikteian cave at Psychro (more of this in the next chapter), are the cave of Trapeza, east of Tzermiado, the Eteocretan site of Karphi (Karfi), founded during Dorian rule, and the 16th century monastery of Kroustallenia, close to Mesa Lassithi.